I built this Depot Hack from parts. The wood is oak with walnut trim. We have an '18 Roadster but with eight grandchilden there was just not enough room. As you can tell we now have it made. The H Belling on the side is in memory of my dad. 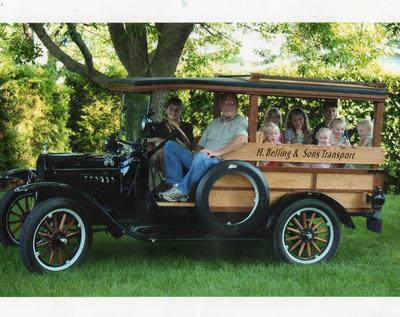 Al Belling 359 Lark Lane, West Salem, Wisconsin U.S.A.
Modelt central is great website which contain the amazing collection of cars, trucks and bikes which are very old and not use commonly now a days. But these collection have very few people in the world. Those people who love your vehicles. I actually, looking australia assignment help which solve such assignments before and do it easily. Thanks a lot. I am very much well-known to know how they see the females. This really gives a smart concept to be careful in such circumstances. Your incredibly lucky about your charitable organisation of Cuba.